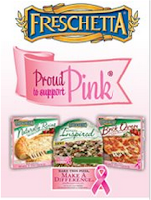 October is National Breast Cancer awareness month and Freschetta is proud to support pink! In doing so, each time you purchase specially marked-packages of Freschetta pizzas and Artisan Pizza Crusts you will be helping them reach their goal of $50,000 donation to the Memorial Sloan- Kettering Cancer Center. In addition, Freschetta is donating 50 pink iPod Shuffle players each week in October to four cancer centers around America to be enjoyed by breast cancer patients during their treatments. Look for specially marked packages that are printed with codes that you can enter at www.ProudtoSupportPink.com. For each code entry, the makers of Freschetta products will donate $1 to this center to support breast cancer research, up to $50,000. Two pairs of FRESCHETTA PROUD TO SUPPORT PINK earphones (one for the winner and one to giveaway). I was sent the identical items. I must say I really liked the pizza. The crust was out of this world having a great flavor to it that I wasn’t expecting. The pizza in whole was delicious. It was so good, that my daughter who normally only will eat cheese pizza, actually went back for seconds! I was aware, and appreciate that you are getting the word out.